A tribal man wanted in connection with the smuggling of uranium ore has surrendered to the police in India’s north-eastern state of Meghalaya. Earlier this week, police arrested five people and recovered a packet of about 1kg of unprocessed uranium from them. It is not clear how much ore the group had, or what it planned to do with it. The arrests are at an embarrassing time for India, just days after the Nuclear Suppliers Group ended a ban on civilian nuclear trade with the country. 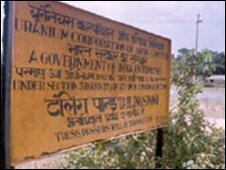 Indian officials had worked hard to persuade members of the group, which governs global trade in nuclear components, that its nuclear industry was in safe hands. Uranium is the basic fuel for nuclear weapons, but it has to go through complex processes before it is sufficiently enriched for use. John Khongmin gave himself up to the police in the West Khasi Hills district late on Wednesday after police circulated a look-out notice for him. Mr Khongmin’s father is an employee of the government-run Atomic Minerals Division. “We are trying to find out whether the group has stolen more and where were they trying to sell it,” district police official M Khakrang said. Police say they are not sure whether the men are part of an organized global enterprise, or simply some amateurs, trying to make some quick money. The seizure was made in the village of Mairang on Monday when police detained four people, including a village headman, for stealing a quantity of uranium. A fifth man surrendered on Tuesday after the police carried out a search of the area. Earlier in May too, police arrested five people for stealing uranium ore.
Others have been arrested in the past for trying to smuggle uranium out of the state. “But we don’t know yet whether this is an organized racket. It could well be and we may have not yet found the kingpins,” Mr Khakrang said. 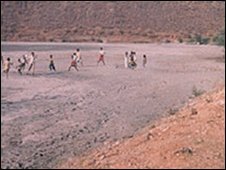 Early in the 1990s, India’s Atomic Minerals Division discovered huge deposits of uranium at Domiosiat and Wakkhaji in the West Khasi Hills. The Indian government announced in January it wanted to open cast mine 375,000 tonnes of uranium ore annually in the area. 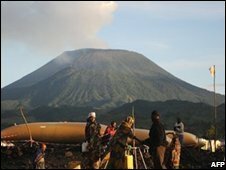 But mining has been unable to start so far because of objections from local tribespeople who fear radiation contamination. Officials say the proposed mines contain 16% of India’s known uranium deposits. India is desperate for enriched uranium to boost its nuclear power generation. It recently signed a controversial accord with the US under which it will receive civilian nuclear fuel and technology. The deal now awaits approval from the US Congress. Sri Lanka’s military says its jets have bombed a Tamil Tiger intelligence center in the north, a day after a rebel air raid on a military base. 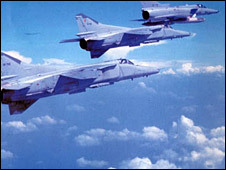 Fighter aircraft pounded the rebel center in the northern region of Kilinochchi, the defense ministry said. Reports from the area confirm an air raid, injuring at least two people. The rebels said civilian homes were hit. The attack came as UN Secretary-General Ban Ki-moon expressed deep concern over the increased hostilities in Sri Lanka. 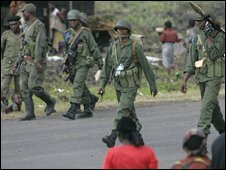 On Monday, the government issued a notice to foreign aid workers to leave the rebel-held areas in the north saying it could not guarantee their safety. On Tuesday, UN officials said they would relocate staff. The government says that it is on track to defeat the rebels. Officials said the area where the latest military operation was carried out is deep inside rebel-held territory. “Taking on offensive raids into the LTTE [Liberation Tigers of Tamil Eelam] backyard, Sri Lanka air force fighter jets made precision air sorties at the LTTE’s main intelligence command and control centre located in Kilinochchi,” the defense ministry said. The region also houses several non-governmental organizations (NGOs) and aid agencies. 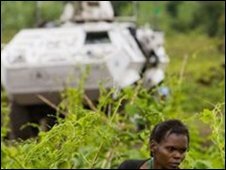 The UN said one of its vehicles was slightly damaged. 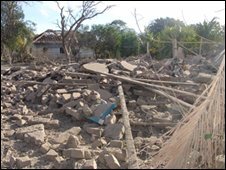 The Tamil Tigers said the air force had bombed a civilian settlement near Kilinochchi town centre, destroying 12 homes. “No one was hurt because people sought safety in the bunkers,” a statement said. Photographs on their website showed buildings they said were civilian houses damaged or destroyed by the bombing. Hospital officials told a pregnant woman had been injured in the bombing. She lost her baby after a stone hit her abdomen during the raid. A child also fainted. There is growing concern for the fate of civilians in the north after the government ordered aid agencies to leave Tamil Tiger controlled territory. The UN secretary general said the fighting had “grave humanitarian consequences for civilians”. “He reminds all concerned of their responsibility to take active steps to ensure the safety and freedom of movement of civilians, allowing humanitarian organizations to do their work in safety, as well as to reach persons affected by the fighting who need humanitarian assistance,” a statement said. Human rights group Amnesty International called for international monitors to be allowed into the north to oversee convoys of aid and other essential supplies. There are about 70 UN national and international workers in areas of the north controlled by the Tamil Tigers, the UN says. Most are based in the town of Kilinochchi. 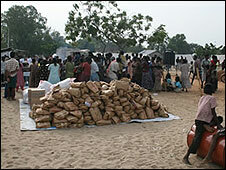 Aid agencies say there are nearly 160,000 people in the Tiger-controlled north who have been displaced by the fighting. The International Red Cross (ICRC) – one of the most prominent international agencies in the north – said that its teams were committed to remain in both rebel and government-held areas. But an ICRC spokesman said that situation was being monitored and negotiations were currently underway with the government in Colombo. Correspondents say that part of the problem for some aid agencies in the north is that their staff cannot leave because they are Tamil locals and the rebels will not issue them with passes. The military meanwhile says that its offensive – aimed at crushing the rebels and ending their fight for a separate state for the Tamil minority – is on course. The ministry of defence said that it shot down a rebel plane on Tuesday in a major incident in which 12 soldiers and a policemen were killed during a Tamil Tiger attack on a base in the northern area of Vavuniya. The Tigers said 10 of their suicide fighters were killed in the raid. They said that the raid was backed by artillery and light aircraft dropping bombs and that a radar station was destroyed in extensive damage to the base. The Tamil Tigers have been fighting for a separate state for the Tamil minority in the north and east of Sri Lanka for 25 years. More than 70,000 people have died. 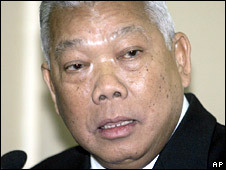 Thai Prime Minister Samak Sundaravej has defended himself in court for appearing on a TV cooking program. In the latest of a series of problems to beset Mr Samak, he is accused of violating the constitution by working for a private company. Protesters have now spent nearly two weeks occupying Mr Samak’s office complex, demanding his resignation. Mr Samak will have to quit if found guilty in this case, which might indirectly end the impasse. Before taking office seven months ago, Mr Samak hosted a popular TV cooking show called Tasting, Grumbling. He continued to make a few appearances on the show after becoming prime minister. A group of senators filed a petition against Mr Samak, saying that a prime minister is barred by the constitution from working for private companies. Mr Samak told the Constitutional Court on Monday that he had been paid for his appearances on the TV show, but was not actually employed by the television company. The court is due to give its verdict on Tuesday. Local newspapers have speculated about the case being a possible short-term solution to the current political stalemate in Thailand – although some analysts point out that even if Mr Samak stepped down, his party could always vote him back in again. For the past two weeks, protesters have been camping outside Government House, refusing to leave until Mr Samak quits, but despite pressure from several military leaders the prime minister has refused to go. Late last week, Mr Samak proposed to hold a referendum on his rule, but the opposition has rejected the offer. The demonstrators, from the People’s Alliance for Democracy (PAD), say Mr Samak is merely a proxy for former PM Thaksin Shinawatra, who was ousted in an army coup in 2006. One man was killed in clashes between pro- and anti-government groups in Bangkok last week, prompting the government to impose emergency rule in the capital.